Just doing some yard work. Well, we've once again reached that part of October where it's almost over, but not quite, so I am forced to not say, "Well, we've once again reached that part of October that is the end of October." In short, it is nearly the end of October, which means if you haven't picked out your Halloween costume yet, you are doomed to spend Halloween night wearing a costume made of sadness. Far, far away on a dark, dark street in the suburbs, there was a house. And in that house lived a werewolf named Steve. 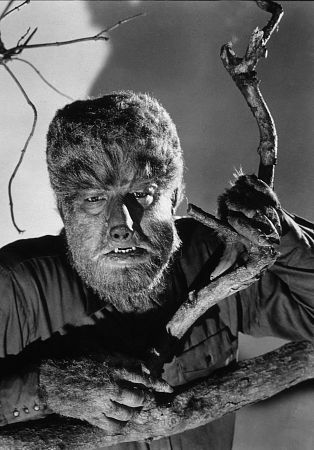 But as you likely guessed, he wasn't always a werewolf. Sometimes he was just Steve, the marketing coordinator. Every morning non-werewolf Steve would go to the office, and a coworker would say, "Hey, Steve. How's life treating you?" And Steve would respond, "Good. Good. How are you?" And the coworker would respond, "Not too bad. Want to grab lunch today?" And Steve would say, "Sure thing" and later, the two coworkers would eat soup together and make awkward conversation. Sometimes after work, Steve would go home, do something boring like read the newspaper, and go to bed. But sometimes--on full moon nights--Steve would go home and turn into a werewolf. And that's when things would get interesting. Because while non-werewolf Steve might spend his nights playing Scrabble against himself before falling asleep at 8 PM, werewolf Steve did things that were far more exciting. On the nights Steve turned into a werewolf, he liked to go out. He liked to get crazy. He would drive over to the local Applebee's and grab a non-alcoholic beer. After that, he would get even crazier. He might head down to the Home Depot and look at lawn mowers. The guy would come on over the intercom and say, "Customers, we will be closing in 15 minutes." And what would werewolf Steve do? He would keep on looking at lawn mowers until FIVE minutes to closing. Then, he would head out to the parking lot AFTER NOT BUYING ANYTHING, get into his Camry, and head out to do something EVEN CRAZIER. Werewolf Steve would drive to the library. The library would already be closed, of course, so Steve would sneak up the front walk. AND HE WOULD DROP HIS LIBRARY BOOKS OFF IN THE OVERNIGHT BOX. And guess what else??? The books would be due that day, and because it was now after closing, Steve would end up paying a nickel in fines! But that's not all Steve the werewolf did on full moon nights!! After going to the library and turning in his books totally late, Steve would drive out to the woods where it was dark and spooky. He would get out of his car and walk down the deserted road. At the end of the long, spooky road, he would drop in unannounced to visit his grandmother!!! AND THEN HE MIGHT HELP HER WITH SOME HOUSEHOLD CHORES!!! "You're such a good boy," his grandmother would say. Then, she would insist on feeding him LEFTOVER SPAGHETTI FROM THE CHURCH POTLUCK FOR DINNER!!! Finally, at 10 PM, Steve the werewolf would do the craziest thing of all. He would head home. He would go in through the garage door, say hello to his cats, and then walk over to the refrigerator to just look in and see if anything looks good. But then he would think about the big sandwich he had for lunch and the leftover spaghetti and decide to pass on an evening snack. But if you think that's the end of Steve's evening, you're wrong. Because after a long day of working, turning into a werewolf, and going out on the town for a lot of crazy errands, Steve would turn on his computer. He would get on the internet. He would go to Amazon.com. And then! Steve the werewolf would look for a NEW SHOWER CURTAIN!!! And then he would fall asleep in his recliner during an old episode of TV's Bloopers & Practical Jokes.